Kiambu Governor Ferdinand Waititu has finally addressed Nairobi Governor Mike Sonko’s claims that they used to smoke a lot of weed in parliament when they were MPs. 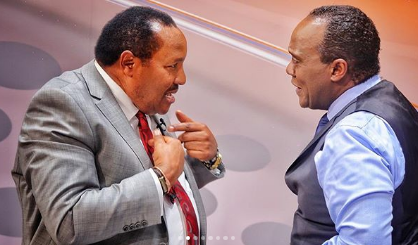 In an interview with Citizen TV’s Jeff Koinange, Waititu denied using any drug in his life and said Sonko was just after tarnishing his name. He’s said Sonko’s accusations were just jokes otherwise if they were don’t by someone else, he would have pressed charges. “I have never smoked bhang or used any illegal drugs in my life. I know why Sonko said what he said, but I never take him seriously. If the same claims had come from somebody else, I would have sued for defamation,” the governor said. Waititu asked Sonko to change his image now that he’s a governor and he’s been tasked to lead Nairobi residents. He asked him to be a responsible man and drop the side shows. “It is very disappointing to hear such words coming from him. He should know he is a leader entrusted with the lives of over 4 million people. It is high time he becomes serious as a leader, not a joker. I sometimes don’t look serious, but I am a respectable parent and a serious person. The days of throwing stones are in the past now,” the Kiambu governor advised.